We strive to offer the most comfortable and personalized attention possible to every patient that visits our Charlotte dentist office serving the Myers Park and Dilworth area. As a result they LOVE us. Not only do we go the extra mile to always make sure our patient is happy with their experiences here and results, we go the extra mile to make sure we provide the most effective and advanced dental services possible. We are thrilled to introduce a brand new dental technique to improve gum recession treatment. Our gum rejuvenation technique is so new that only a select few dentists in the world are offering it. Though it is so new, this gum surgery technique is incredibly safe. In fact, gum rejuvenation is much less invasive than traditional gum surgery involving gum grafting. 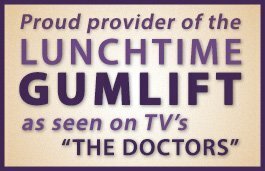 If you watch the TV show “The Doctors,” you may have seen the segment that explains the Receding Gum Treatment, and particularly the spot about the procedure the “Lunchtime Gumlift.” In this episode, it describes this amazing Lunchtime Gumlift process. Receding Gum Treatment is fast, safe and is almost completely pain-free! And yes, it can be done so quickly, you can get the treatment during your lunch hour. That’s why it’s called the Lunchtime Gumlift treatment. It’s really as remarkable as the television program claims it is! Gum recession is the term used to describe gums shrinking back and exposing tooth roots. This recession has multiple causes and can have severe consequences including gum disease and even tooth loss and bone deterioration. Gum grafting up to this time had been the best solution but involved cutting soft tissue from the roof of the mouth and grafting it to the gums. This can be painful, protracted and inconvenient. The gum rejuvenation technique and gum surgery we now offer is truly revolutionary and we are excited to share it with our patients! NO MORE PAIN | The gum rejuvenation technique is so non-invasive and so gentle that it is almost entirely painless. You will be amazed at how comfortable this gum recession treatment is. SHORTER TREATMENT TIME | Dr. Bowman is able to treat 4-6 teeth per hour with the gum rejuvenation technique versus one tooth per hour or two with gum grafting. Also, all of your teeth can be treated in one day. This means you need not worry about multiple trips to your Charlotte dentist for additional gum grafting treatments. EFFECTIVE | This gum recession treatment is remarkably effective and can give you the long-term results you are hoping for immediately. LESS INVASIVE | The size of incision needed for the gum rejuvenation treatment is the size of a pinhole. Literally. FASTER HEALING | Healing time is reduced from three weeks for traditional gum surgery using gum grafting to one day with the gum rejuvenation treatment. If you are looking for a gum recession solution and are worried about the pain, healing time and inconvenience associated with traditional gum surgery, schedule a visit today with our office serving the Charlotte, Myers Park and Dilworth areas to learn about our gum rejuvenation technique. Am I good candidate for rum rejuvenation surgery? To learn more about all of our dental services, please visit our main Charlotte dentist website!